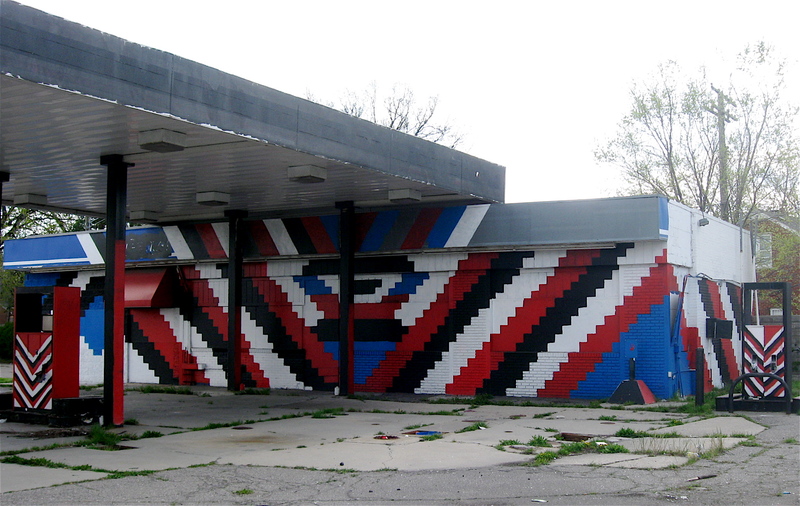 I saw some murals the other day while riding through a couple of Detroit’s neighborhoods. 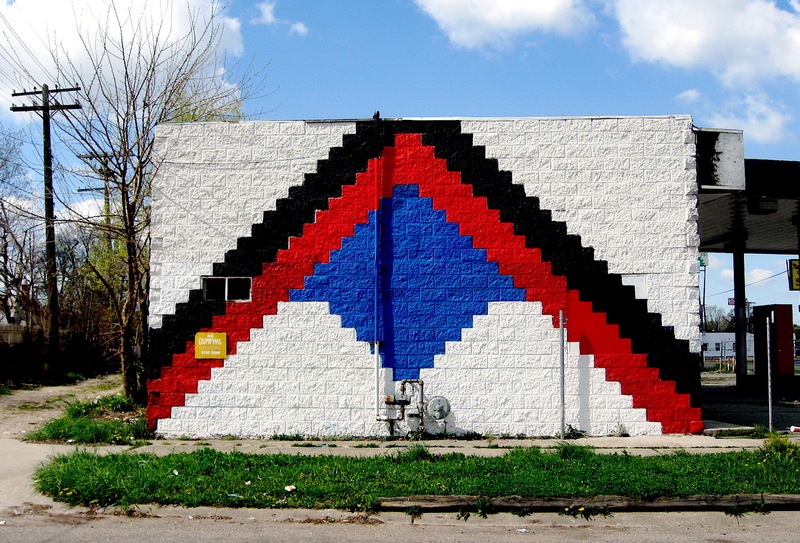 They weren’t large murals like those found in Southwest Detroit. They weren’t religious in nature; nor were they as intricate as some of the huge graffiti paintings I’ve seen on walls along railroad tracks or on the sides of manufacturing facilities. 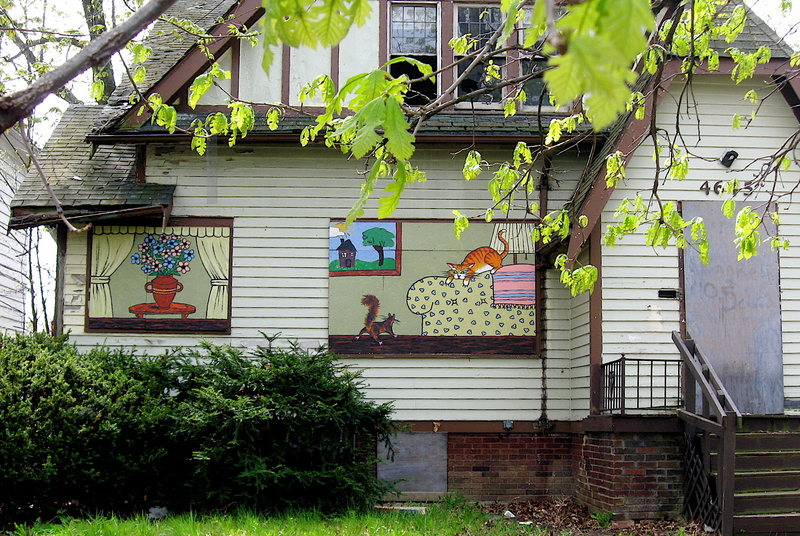 The murals I’m referring to can be found on abandoned homes throughout the Morningside Neighborhood and parts of the Creekside Community. Both neighborhoods are on Detroit’s far eastside. 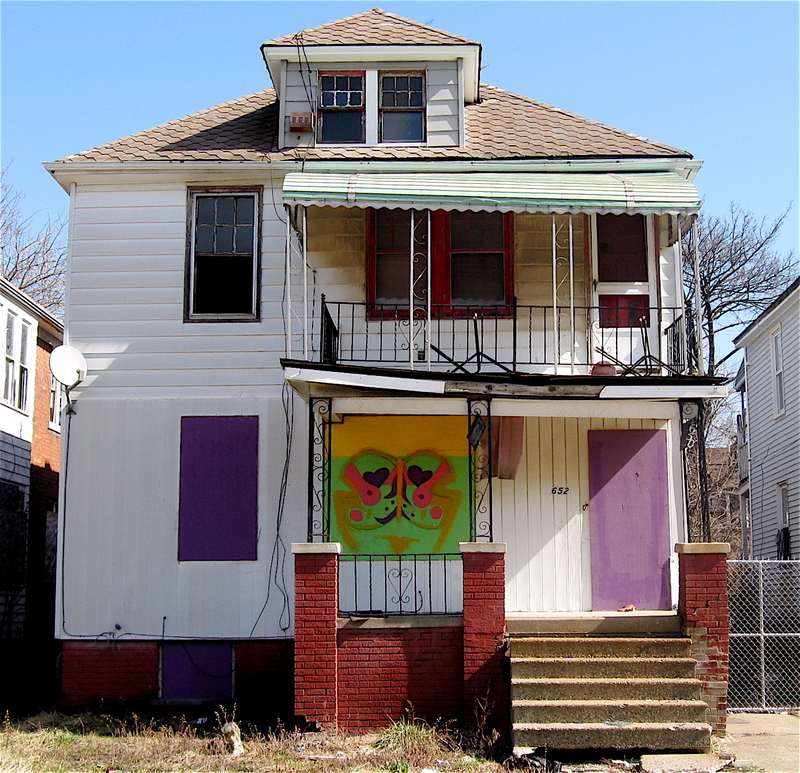 The colorful murals are small and located on vacant, blighted homes that are scattered throughout the neighborhoods. 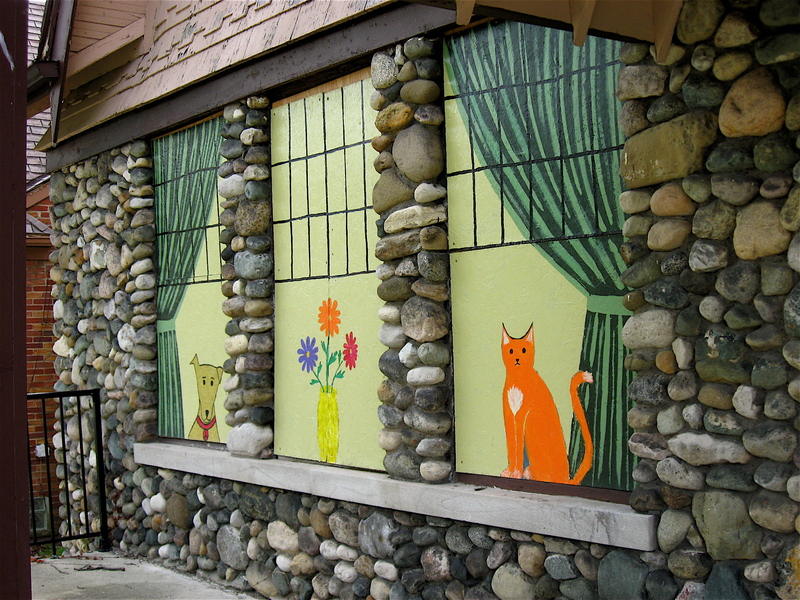 They have been painted on plywood that now cover the openings of the homes where windows and doors once were. Their intention, I’m sure, is to diminish the harsh reality of the numerous deserted homes found in their respective communities. A few of the blocks I rode appeared to have more unoccupied homes than those lived in. 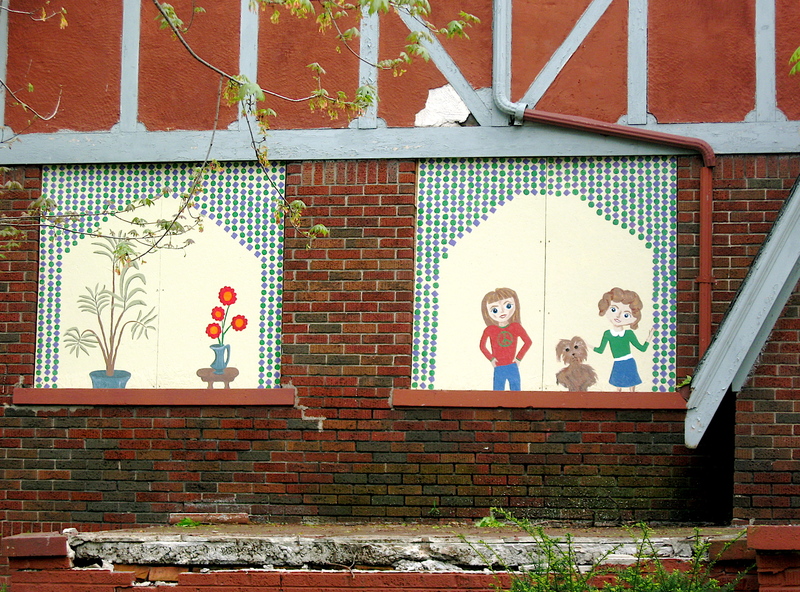 On those particular streets, it was uplifting to see one of the mural covered homes among the abandonment. 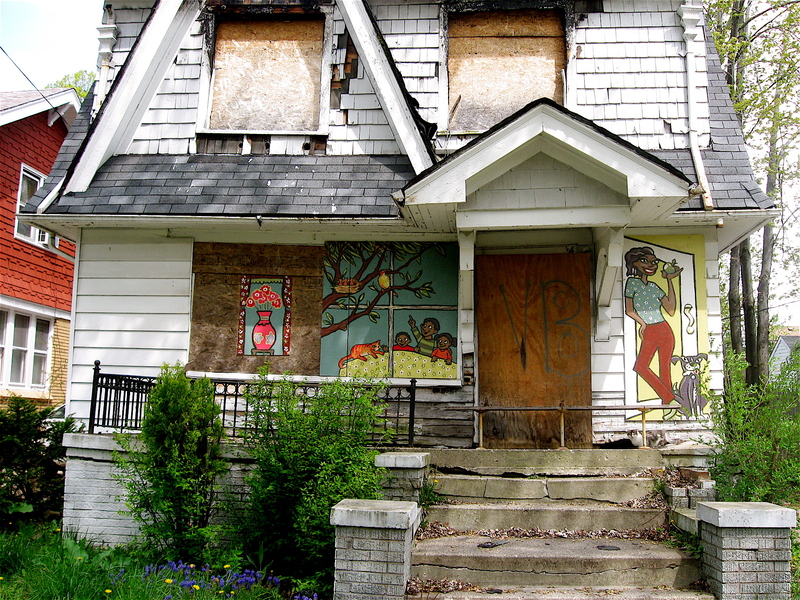 The murals seemed to soften the bleakness of the abandoned homes, adding interest, freshness, and a little color to the forlorn structures. The feeling I got while looking at the many murals was that there are people in the neighborhood who care about their surroundings and quality of life in Detroit. Unfortunately, I don’t know who painted and installed the murals, but they should be commended for making a difference in the community. 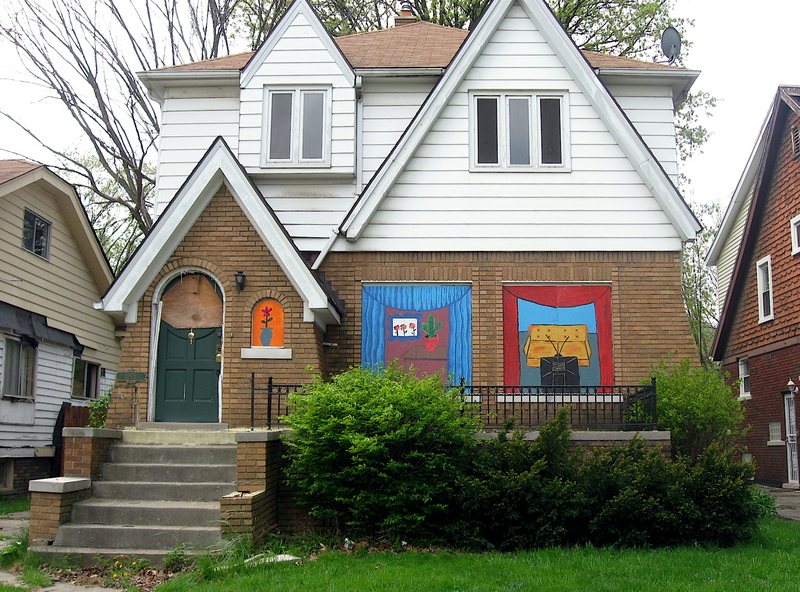 Not only are they helping the image of the neighborhood, the murals might also be an inspiration to some kid living in one of those tough neighborhoods, to pick up a paintbrush and explore his or her creativity. Reminder – You can click on the photos to view them larger. 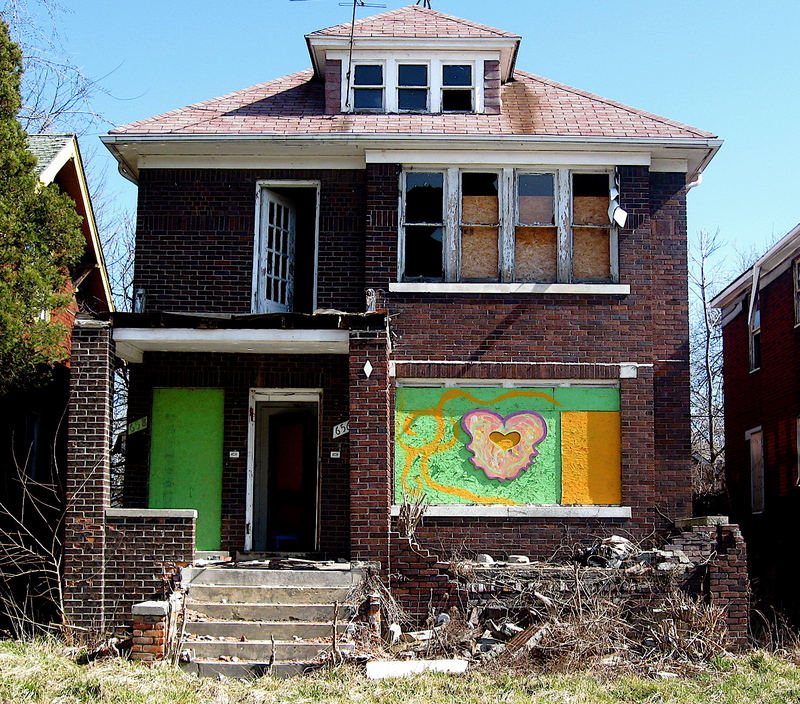 Most of us know that Detroit has no shortage of abandoned buildings. They seem to be everywhere I’ve been riding lately; from the heaviest populated neighborhoods to some of the most abandoned and deserted areas of the city. 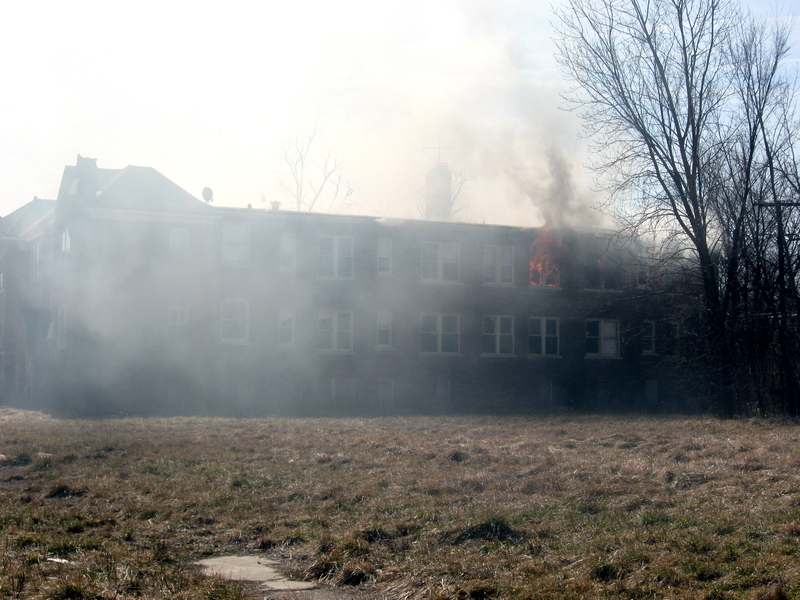 With so many derelict buildings lining both the commercial roads and neighborhood streets in Detroit, it isn’t unusual for me to occasionally come across a burning building. That was the case while riding up Jefferson Avenue from Belle Isle a few days ago. 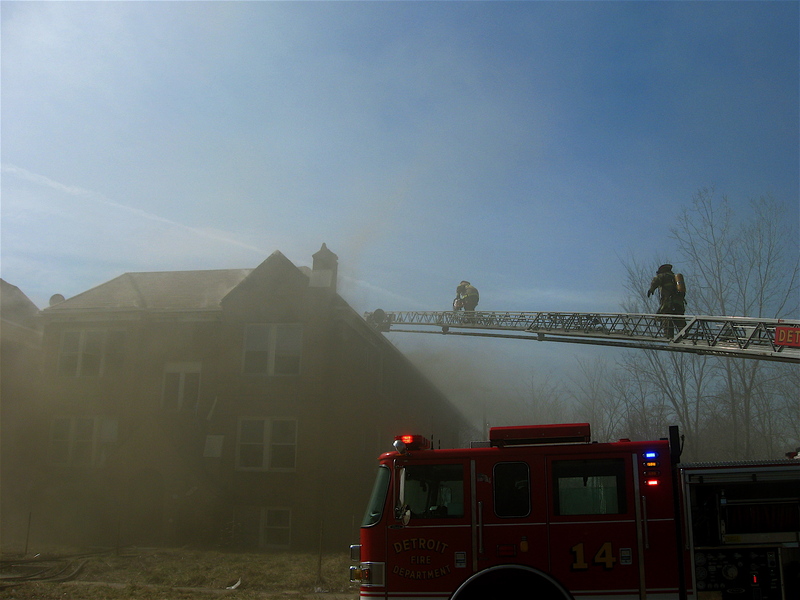 On that particular day, I spotted heavy smoke filling the sky just north of Jefferson near Chalmers Street. So I headed over there to check it out. 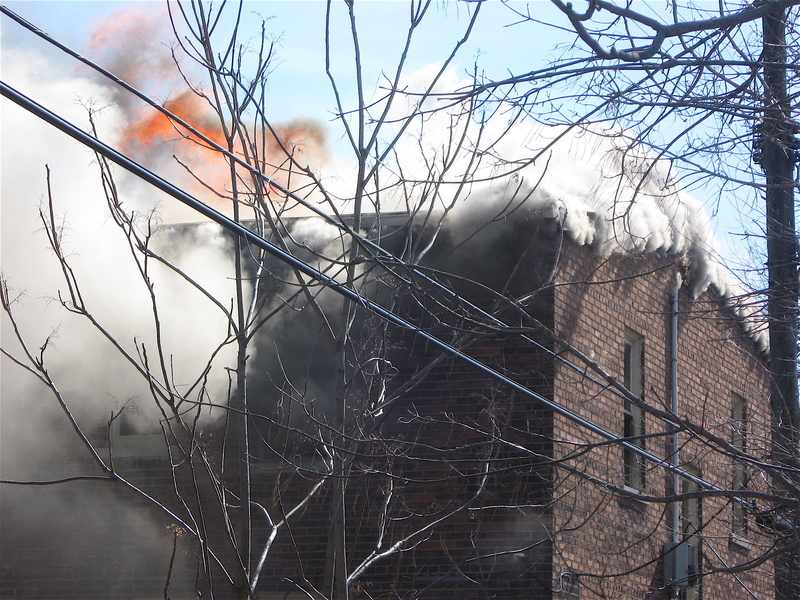 Halfway up the block I was on, I saw an abandoned three-story apartment building with smoke and flames coming out of the roof and windows near the back. I was there well before the firefighters arrived and there were no others, except for a couple of people I passed near the end of the block, standing on their porch, looking at the burning building. 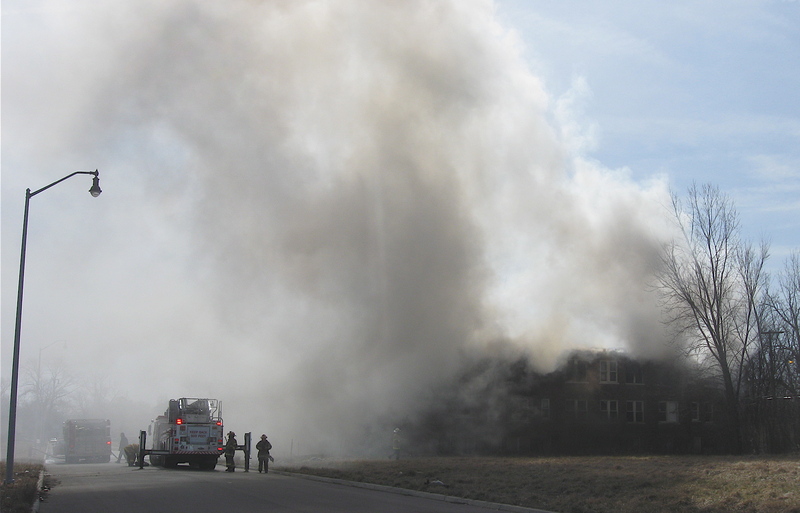 There was something strange about being the only one nearby watching a three-story structure burning out of control. While watching the smoke and flames coming out of the building, I could hear the crackling sound of burning wood, and a couple of explosions from deep inside. I could also hear sirens from fire trucks in the distance, growing louder as they neared the flaming building. They seemed to arrive at the apartment building in waves. Once there, a couple of the firefighters rolled out hoses from the truck and attached them to a nearby hydrant, while others slipped on their firefighting equipment and prepared to enter the building. One of the trucks on the scene was a ladder truck. After it was positioned close to the building, the huge ladder swung into place and the firefighters extended it above the burning structure. A team of firefighters entered through an open door on the main level to fight the fire from below. 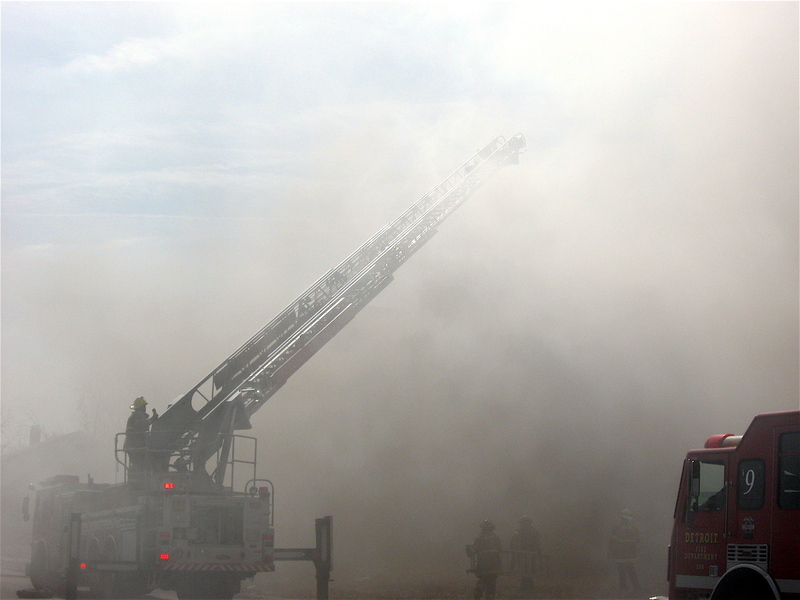 Others made their way up the smoke-encased ladder to the roof of the building with tools in hand. From the top of the ladder they carefully stepped onto the roof, slowly edged their way to the back of the place, and began chopping holes in the roof. Through the holes, they poured water on the flames below. 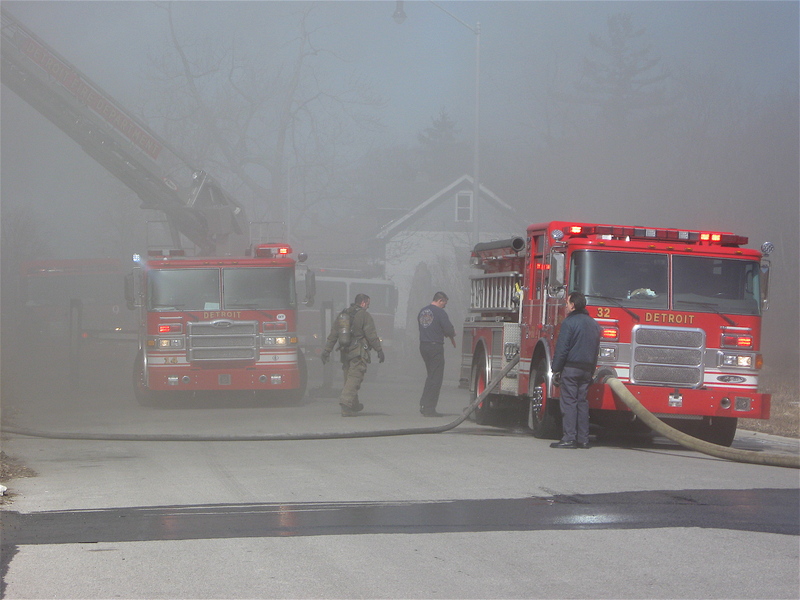 It didn’t take long for the firefighters to get the fire under control. 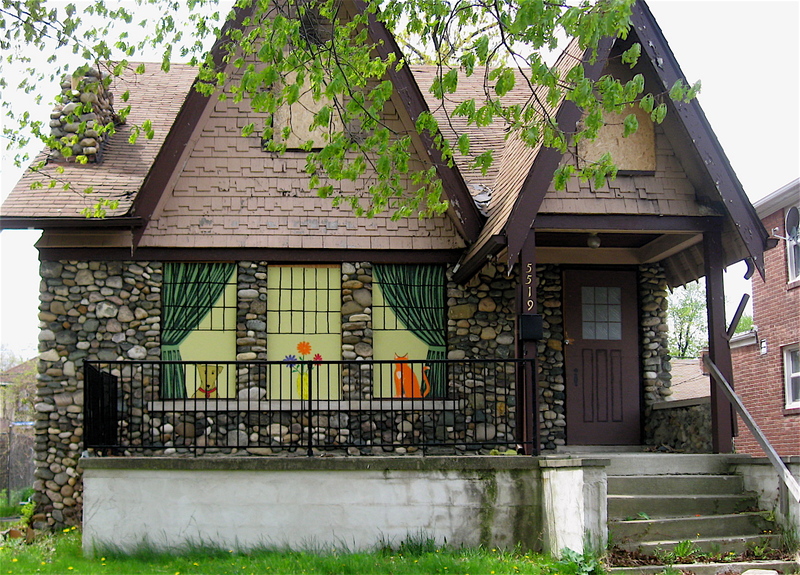 As I’ve written in the past, Detroit has some unusually painted buildings. Many that I see have colorful painted pictures of hairdos. Some feature crudely painted smoking ribs laying on a half-barrel with what appears to be amber-colored flames shooting out of it. On the sides of other buildings I’ve seen advertisements with well-spaced, evenly stacked, brightly colored letters announcing the store sells liquor at the State’s minimum cost. Others I’ve spotted while bicycling across this city are so badly drawn and painted that I wonder how they generate any business at all. By far some of my favorite (and least expected) painted buildings are those that create a colorful, striking pattern splashed across the structure, literally from one end to the other. There is one such place, an abandoned gas station, on Harper Avenue near Cadieux Road. 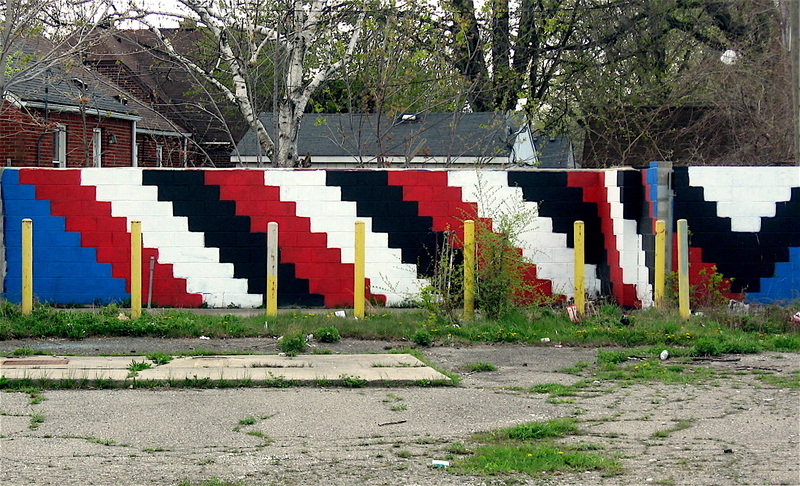 Not only is the former gas station building painted in various simple no-nonsense colors of red, white, blue and black; so is the cinder block privacy wall that lines the lot. The color scheme on both follows the outlines of the blocks, creating an unusual sharp-edged geometric layout. 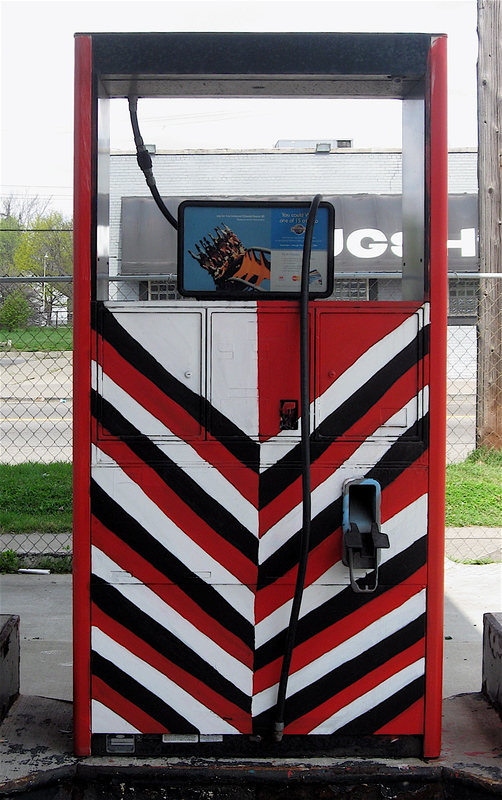 The overall paint job, with its bold colors, reminded me of a design that may be found on a Native American saddle blanket. 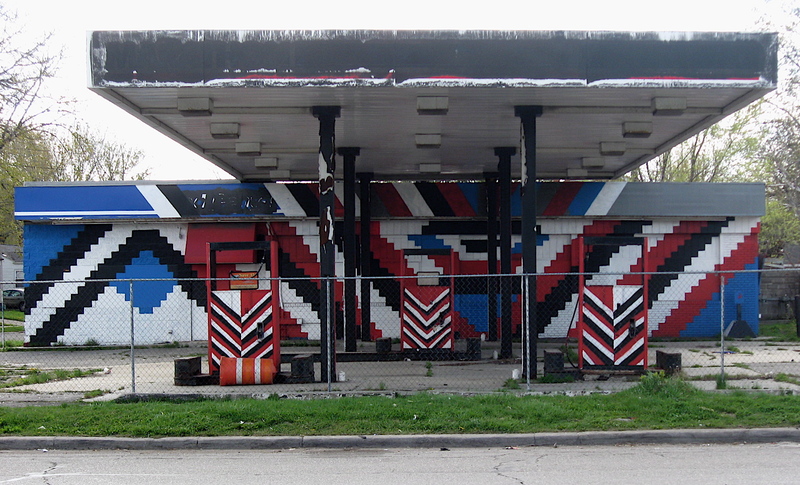 The painted non-functional gas pumps follow the interesting graphic outline found on the building. Despite no logical lines to follow, like the evenness of the off-center spacing of the building’s cinder blocks, the gas pumps are not badly painted. Some of the contrasting colors are a bit wavy, but overall, they are not too ragged and look balanced. Looking at this painted treasure I had to admire the painter’s vision, planning and dedicated amount of time needed to create this eye-catching piece of urban wall art. It must have been quite a task just to figure out the various angles, the color proportion and the final design the painted cinder blocks would take once the job was completed. 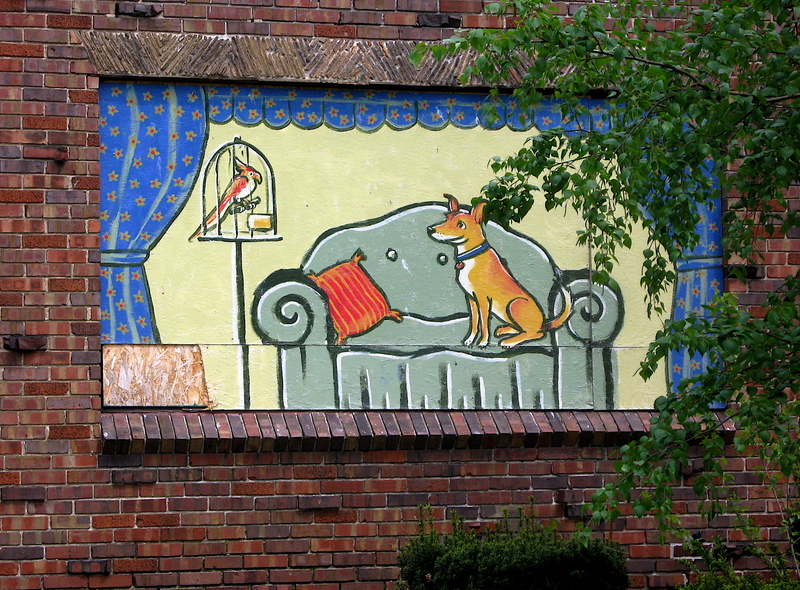 If you like this painted structure, check out “A Building with an Artistic Touch“. 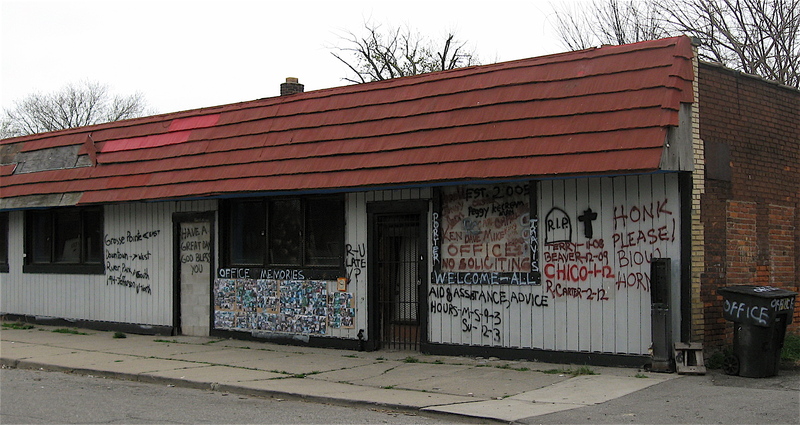 While riding my bike through a far eastside Detroit neighborhood, I came across an interesting office. It wasn’t the typical office where employees may be seen answering phones, meeting with clients in a conference room or sitting at desks busily at work staring into a glowing computer screen. From what I could tell, this particular place had none of that. 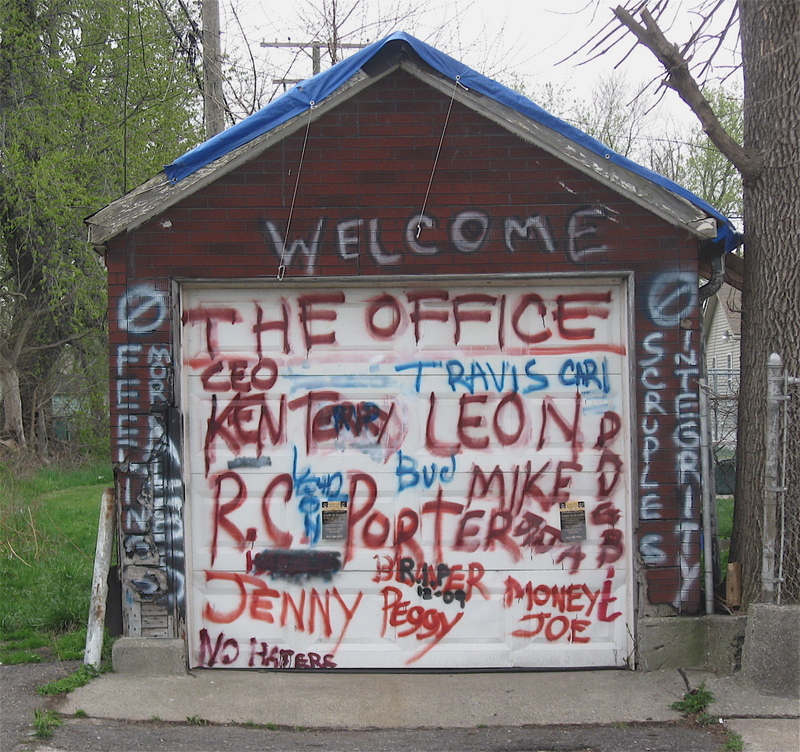 In fact, the spray painted name on the outside of building read “the office”. I’m not sure what this office is though. 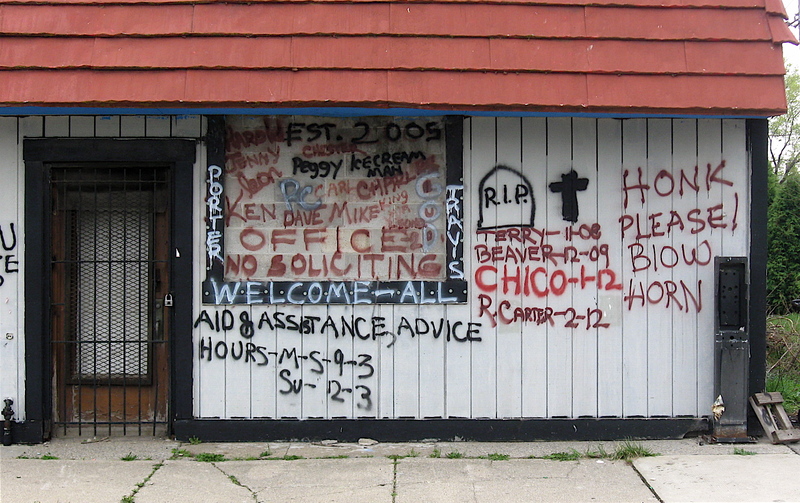 Based on the variety of spray painted words and names found on the weather-beaten, run down commercial building, and on an adjacent garage, it almost appears to be some type of counseling center. Many of the words seem to be names of people with dates right after them. Based on the RIP tombstone crudely painted on one of the walls near the names, I would assume they are individuals that have died. 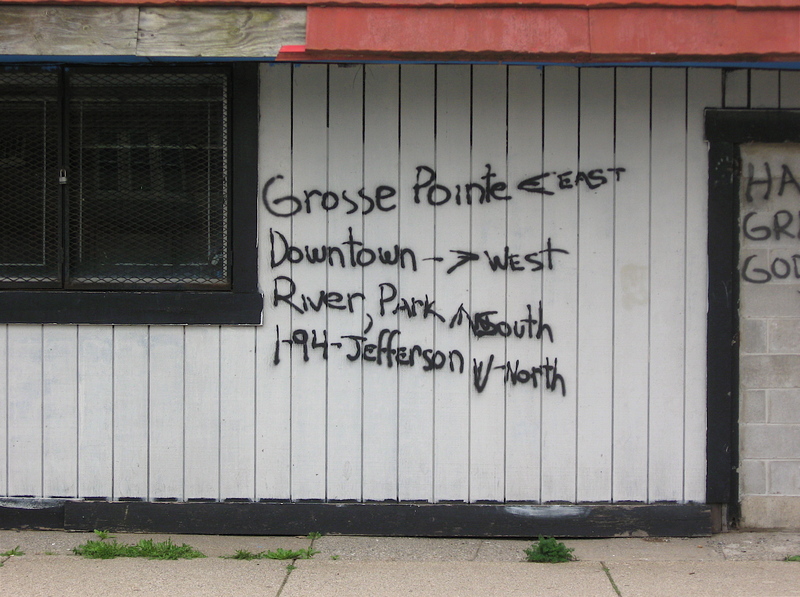 Also on the building, was a makeshift spray painted sign with directions to Grosse Pointe, Downtown (Detroit), the river and to I-94. 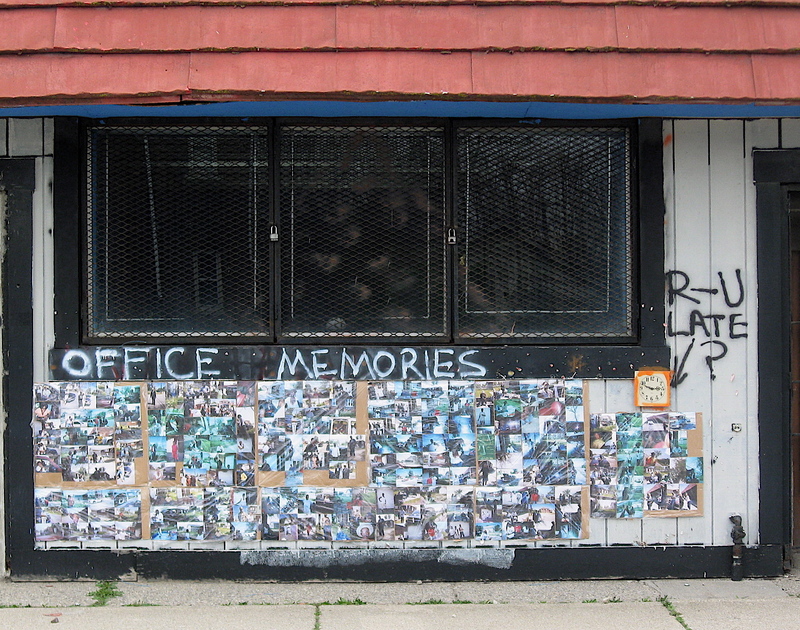 In addition to the many spray painted messages and names found on the exterior of the one-story building, there is also a large section where many color photos have been posted. Most of the ones I saw were of kids and teens. Perhaps they play on a community sports team, are part of a church group or merely from the neighborhood and have been counseled in some way at this office. It could also be a place for mentoring young people, teaching them the right things to do in life. It’s hard to tell what this curious place’s mission was. Whatever this may be, near the corner of Freud and Clairpointe streets, it appears those involved are trying to make a difference for those living in that old, tattered Detroit neighborhood.